Shaelynn Sanchey looks to pass the ball in the opening possession for the Lady Hawks. The Tulalip Lady Hawks (0-5) hosted the Orcas Christian Saints (2-1) on December 16, 2014. 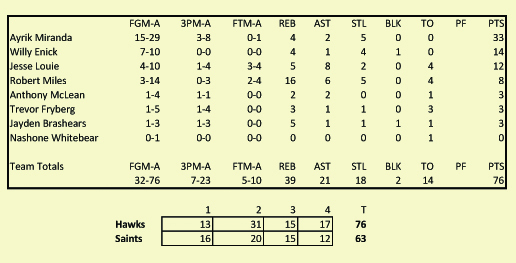 Coming off a narrow defeat to archrival Lummi in a previous game, the Lady Hawks were looking to rebound with their first win of the season. Coach Cyrus “Bubba” Fryberg and his Lady Hawks would have their work cut out for them as they would be playing with only 5 eligible players, meaning no bench and no substitutions for the already thin roster. The 1st quarter got off to a rough start for the Lady Hawks as the Orcas Christian Saints played a full court press defensively the first several possessions that resulted in consecutive turnovers by the home team. To make matters worse, the Lady Hawks looked slow and lethargic while not hustling to rebounds. Because of the lack of energy the Saints collected 5 offensive rebounds on one possession. With 3:00 remaining in the opening quarter the Lady Hawks found there hustle and looked like they were ready to play for real. There was an offensive focus to get the ball to the Lady Hawk bigs Nina Fryberg and Jaylin Rivera. Both were able to get into good offensive position and get off clean shots, but they didn’t fall. The 1st quarter ended with the Lady Hawks trailing 0-11. Following the lackluster 1st quarter showing, Coach Fryberg urged his players to push the tempo offensively and for the guards, Michelle Iukes and Myrna Redleaf, to be more aggressive while looking for their shots. After giving up a quick bucket to go down 0-13, the Lady Hawks buckled in defensively to force back-to-back turnovers. Michelle Iukes showed her coach the aggression he was looking for by pulling down an offensive board and getting fouled on the put-back attempt. Michelle went one for two at the free throw line to put the Lady Hawks on the board 1-13. On the very next possession Myrna found a wide open Michelle who swished in a 3-pointer. Moments later Myrna forced a Saints turnover and Coach Fryberg called a timeout. He drew up a play that was executed to perfection and resulted in Michelle hitting another 3-pointer. The Lady Hawks were on a 7-0 run and brought the score to 7-13. The Saints responded by hitting a 3-pointer of their own, followed by a Nina Fryberg free throw and a baseline jumper by Michelle. With the score now 10-16 the Saints called a timeout. Coming out of their timeout, the Saints ran a defense that this basketball enthusiast hadn’t seen before. Later I learned it was called the diamond press or 1-2-1-1 full court press. It’s a trapping man-to-man defense that only works if you have quick guards who can “heat up the ball” in a one-on-one situation. This means getting the ball handler out of control and blinding him from the impending trap, which comes from a secondary defender who’s lurking near half-court. For the remainder of the 2nd quarter, the Saints remained in their diamond press defense and the Lady Hawks committed eight turnovers while not scoring another point. At halftime the Lady Hawks trailed 10-24. 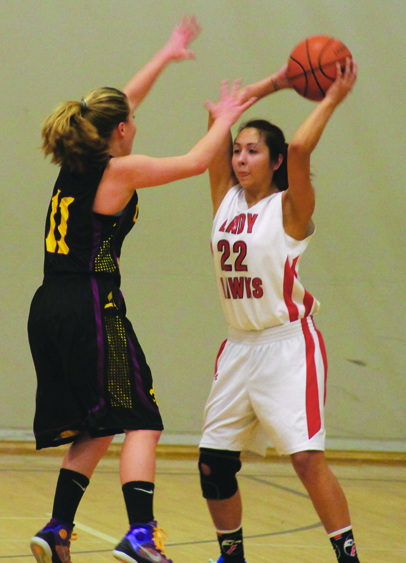 The Saints’ diamond press defense continued to stifle the Lady Hawks in the 3rd quarter. Following back to back turnovers, Myrna found an open Michelle who shot and made her third 3-pointer of the game to make the score 13-26. Over the remainder of the 3rd quarter the Lady Hawks would only score two more points, scored by Jaylin Rivera, as the Saints defense continued to slow down the visibly frustrated Lady Hawks. Meanwhile the Saints were getting easy buckets off of 14 forced turnovers. Going into the 4th quarter the Lady Hawks trailed 15-41. After getting the short break to rest before the start of the 4th quarter the Lady Hawks came out hustling. They were running back on defense and not letting the Saints take uncontested shots. On offense the shots weren’t following until Michelle inbounded to an open Jaylen who made an elbow jumper to make the score 17-41. Unfortunately for the Lady Hawks that would be their last basket of the game as Jaylin soon after fouled out. Having no bench players for this game meant the Lady Hawks would play the rest of the game 4-on-5. This added challenge made it difficult to get any offense going. 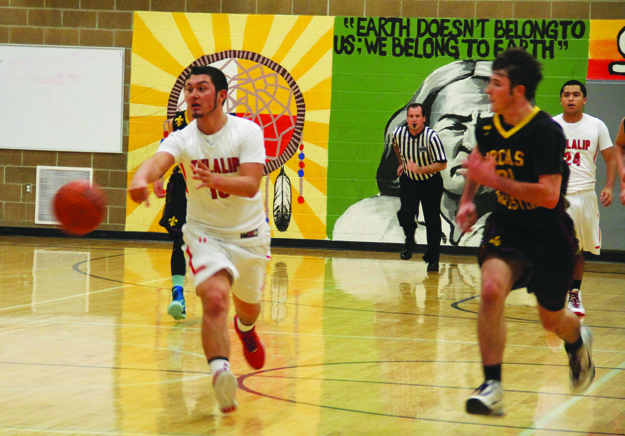 The game ended 17-49 in favor of the Orcas Christian Saints. The Lady Hawks remain positive and are determined to get their first win on the season in the coming weeks.